I want to review something, but nothing I've bought lately cries out to be reviewed. However, there are a number of new adventures out this week that look interesting...or maybe I'm just being lazy. S4 The Mines of Mayhem - I have a mental picture of a mine being worked not by dwarves, but by 80s wrestlers. This is enhanced by the author randomly putting words in his blurb in ALL CAPS. But it seems to be a sprawling low level dungeon crawl (2nd to 4th level). 110 pages, and $20. Also comes with an illustration book. The Sunken Fort - Mid sized (80 room) dungeon for low level characters, apparently a lead-in for a forthcoming megadungeon. $5, 27 pages. Five Items - I'd rather have the 99 cents. 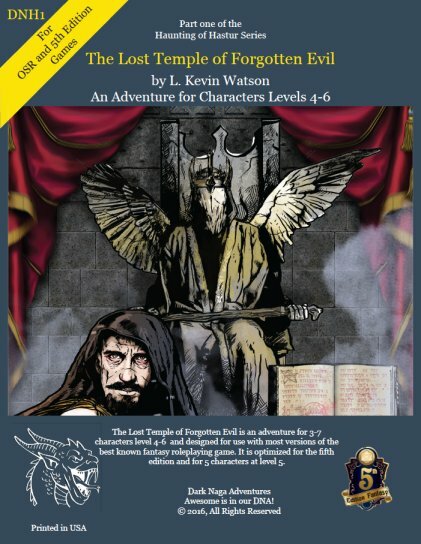 Knave - Seems like a classless take on OSR, but compatible with adventures and monster books. $2.99 and 7 pages. Was going to write a review, but got caught up in playing The Bard's Tale remastered. Then I thought "Why not review that?" But then I realized I'd need to play even more of it. With the exception of spell points, I had forgotten how D&D-ish it was. The Remaster seems much easier, though. Even though it offers a save anywhere system, I have no yet had any problems getting back out of a dungeon yet. Disruptors & Dyson Spheres - This confuses me, as it says it's an old school RPG yet is only 2 pages. Even naval combat took up way way more than that in OD&D. PWYW. New Golems of the Labyrinth - New golems meant for B/X (which actually had quite a different set of golems to being with) - "Cerebral, Ectoplasm, Flesh-and-Blood, Gas Metal, Leaf, Lightning Rod, Magic, Particulate, Shield, and Water Chariot Golems." 99 cents and 10 pages. Fantastic Wilderlands Beyond: Revised Guide - Guide for said map. 38 pages, $4.99 PDF, $6.99 PDF+map, though it indicates that PDF is also with the PDF above. Niti's Parade and Other Entertainments - Free advertorial supplement about carnivals. Random Terrain and Encounter Generator - Joseph Bloch's foray into random table territory. Probably at least coherent, unlike most others. $9.99 and 105 pages. RPGPP #44- Medieval Authentic Activities for Successful Medieval Authentic Characters- Don't drink the water, use the long s, watch out for giant falling helmets, and probably more. $2.99 for 19 pages of silliness. DarkMoore Critical Hit & Critical Fumble Tables - I am not a big fan of them, but if you are, here you go. Free. Clipart Critters: Elder Thing 2 - Only mentioning this because it's free. Basically head shot of a crippled Elder Thing (only 4 tentacles instead of 5). I actually had no idea this was in the works (I stopped following the Bard's Tale IV Kickstarter when they announced Sean Reynold's was involved. Call me petty, but I've still got a grudge against him from the last TSR days when he served as their internet enforcer, harassing people with fan material). While probably my favorite old CRPG was Might & Magic, the Bard's Tale was up there. 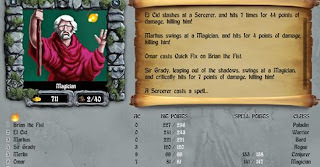 Early on it was pretty similar to Wizardry using a D&D-ish system. The Bard's Tale came from about a dozen years ago, the action-RPG with Cary Elwes actually had the original BT games in it, but they were emulated Atari ST versions. This is an actual re-master and features an automap and other modern amenities and apparently some new graphics for female PCs. Also, don't forget: Big meteor shower this weekend. DarkMoore Adventures - Apparently actually about "The Iron Dragon" Inn. PWYW, 59 pages. RPGPP #42 At the Darkness - Comedy adventure. $2.99 and 17 pages. The Forbidden Barrow - Seems like a starter adventure. $2, 15 pages. Microlite20 Comprehensive Edition - Seems to be a distilled, just the good parts version of the rules, plus art. $7.50 and 164 pages. Microlight20 Comprehensive Edition (No Art) - PWYW version of the game rules. Random Esoteric Creature Generator - Want to generate a completely nonsensical monster? Well, this is for you $9.99 and 64 pages. The Little Book of Adventuring Classes vol 2 - 8 new classes (Barbarian, Ninja, Navigator, Summoner, Scholar, Runecaster, Vanguard, and Warmonger) plus some new races for S&W. $3.99 and 60 pages. Friday Enhanced Map 8-10-18 - Underground temple and cave complex. $1 for enhanced version. A couple of new adventures for Astonishing Swordsmen & Sorcerers of Hyperborea. Honestly, I've been underwhelmed by their past recent adventures. Basically they take a Robert Howard or HPL or CAS story, mangle it, dumb it down, and call it an adventure. I guess it depends on whether you like the original Conan stories or prefer the comic (the modules following the latter). Untold Adventures Deluxe - Because apparently we need a rules lighter version of S&W Whitebox every two months. PWYW at least. Guild Adventures! The Dragonslayer - My guess from the preview is that it's actually a Fighting Fantasy style system, but eh, at any rate it's a solo gamebook which I enjoy, though probably not $6.99 worth. 163 pages.